Very good condition leather bags new battery. First to see will buy runs sounds and drives like a dream. selling due to ill health ive only rode 40 miles since last mot. will come with new mot .full stage one with sns filter and vance and hines short shot exhausts,new battery and coil fitted runs and souns brilliant, also comes with sidecar that i took off after the wife hated that as much as she hated the pillion. collection only.forgot to add sidecar seat was reuphostered last year and its got a new tourne cover. But it seems as if every mod has been done, I am in love with the velvet like clutch action, its a fluid one and a very expensive lock up type, the carb is a hsr 42, and the engine has been upgraded with Jerry Branch big bore cylinders and heads. 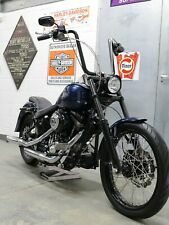 1997 Softail FXSTC 1340 Evo Engine with 5 Speed Transmission. There are no Indicators and as you can see in the pics only one mirror to keep the look minimal & clean but i have the indicators here and will happily fit if required or they can go with the bike incase you change our mind down the line. Perfect runner Softail Deluxe. call Simon 07511102897. Nothing to write about that bike is just brill! FXSTD SOFTAIL DEUCE ONE OWNER FROM NEW LONG MOT STAGE ONE WITH MEGAPHONE EXHAUST, EXTRAS INCLUDING HEPCO AND BECKER FULL LUGGAGE SYSTEM. Grip Cycles - Grip Cycles for all your Motorcycle and Cycle needs. - Call us on 441723335970 or click here to find out more. Tons of fun to ride too with a really well sorted motor and sounds fantastic through screaming eagle straight shots. 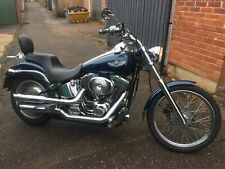 A well pampered Harley and with only 4000 miles it shows and rides like a new bike,super cool looking, recent service, long mot and ready to roll. It has a low mileage of 7750 miles. The bike is in perfect condition, it’s been regularly serviced at Harley Davidson, along with its mot’s done at Harley Davidson also. The Harley has got Vance and Hines exhausts and screemin Eagle air intake. Harley Davidson leather studded panniers and fittings. Original Harley Davidson screen. A BIG Twin for sportster money. Good tyres. Sissy bar and back pad. Starts and runs fine. A VERY CLEAN LOW MILEAGE EXAMPLE OF THIS GREAT TOURING BIKE. VERY LOW MILEAGE AT 13,639. THERE ARE NO ISSUES WITH THIS HOG,GET READY FOR SPRING BECAUSE IT WONT BE LONG. SISSY BAR,RACK,DETACHABLE SCREEN.